Hello, everyone. Like everyone here at Obsidian, I hope you had a great holiday season and were able to gorge on lots of treats and good food. This week I am going to go over a bit about the new Backer Portal (please log in if you haven't already), give a general update about where we are in our production, and show off some of the cool things that are happening in the game. In our next update we will be taking a more detailed look at some of the classes in Eternity. Just a reminder to all of our backers, if you have not done so already, please head to the Backer Portal and complete your order. All backers need to go through the process so they can receive their rewards - even those that only have digital goods. To start the process, click on "Manage My Pledge Now" and click on the "Select Reward" button on the pledge management screen. From here, you may select the tier you backed (or upgrade to a new tier), select additional add-ons, fill out any shipping information, and file your surveys. Also, please make sure you fill out your surveys as soon as you can. If you have an NPC, item, inn, or portrait the sooner you get the information to us, the sooner we can make sure it gets into the game. 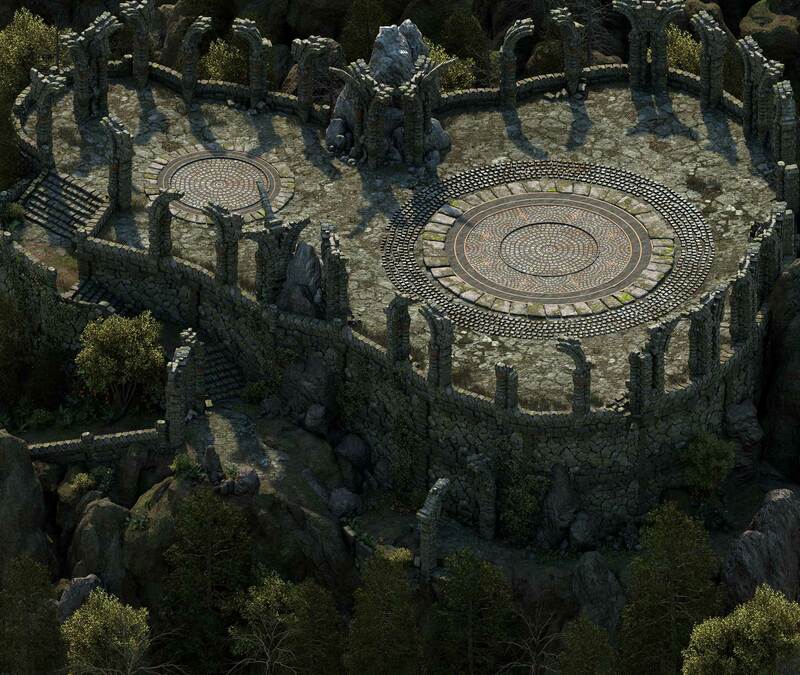 If you are having any issues, e-mail us at support@obsidian.net and we'll help you out quickly. As most of you know, we finished up Od Nua (our mega-dungeon) in our last milestone. I have to say, I think it looks pretty amazing. Currently, the area team is working on our second big city, Twin Elms, and it is looking just as good. Here, take a look for yourself. Ancient Engwithan ruins near Twin Elms. Without getting into too much detail, the Area Designers are fleshing out the end of the game right now and everything is really coming together. 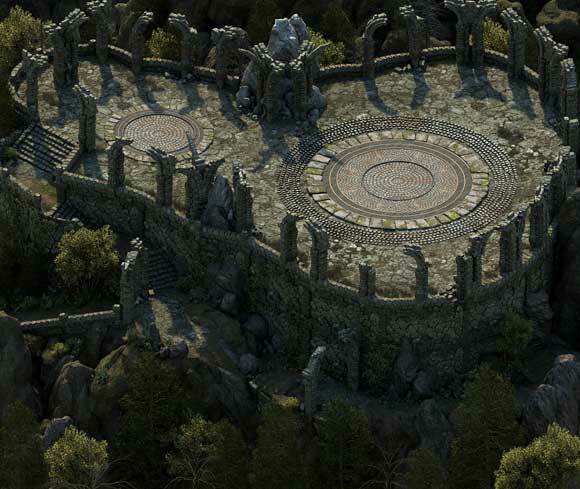 The area in the screenshot above looks like the perfect place for a big fight, huh? Our character team has been cranking out new creatures and equipment. We are almost completely through all of our A priority creatures. Soon we will be working on our B priority creatures and lots of equipment variations. One of the creatures that was just finished to Alpha quality is the Cean Gŵla. These banshee-like undead are the spirits of women who died under particularly tragic or traumatic circumstances. Take a look at the comparison images below. In-engine and concept comparison of the Cean Gŵla. Most of our UI has either been implemented or mocked up to an Alpha level. 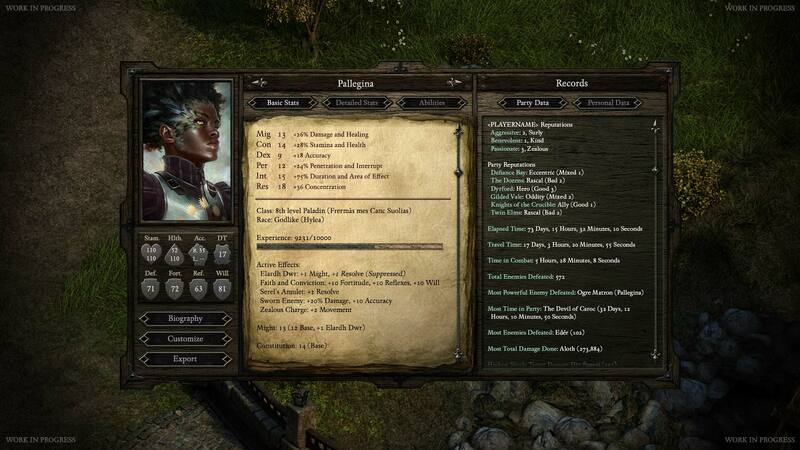 The interface that we would like to show you today is the character sheet, which shows character and party information. 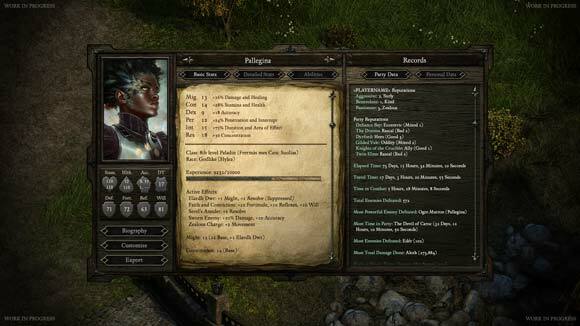 You can find lots of useful info on the sheet including various party statistics, your reputations with Eternity factions, and character stats. The character sheet has many useful player and party statistics. Features have been going into the game pretty regularly. We just recently moved to Unity 4.3 and, while this might not seem like a big deal, 4.3 has ushered in some long awaited features. Animation annotations, for example, were added to Unity. We can now call sound effects based on specific frames of animation. This makes things like footsteps possible. A majority of our spells and abilities are in-game and usable. Josh has started auditing them and requesting changes for gameplay balance purposes. Tim has been quite busy with all of the small edits. Strangely, one of our more minor features has gotten me the most excited. Just recently we have gotten the ability to set custom party formations and I am having a blast testing it out. 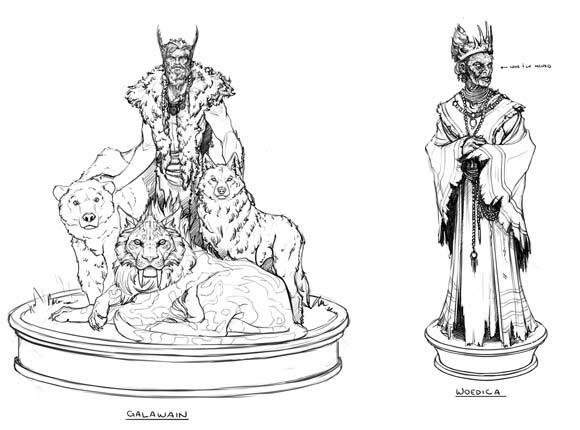 Have you been wondering what some of the Pillars of Eternity gods look like? Wonder no more. Representations of the gods Galawain and Woedica. Above you will see the representations of Galawain and Woedica, gods in the Eternity pantheon. Woedica is known by many names including "The Exiled Queen," "The Burned Queen," "Oathbinder," and "The Strangler." Her domains include law, justice, oaths and promises, (rightful) rulership, hierarchies, memory, and vengeance. Priestesses of the Exiled Queen serve as lawyers and judges in towns and urban centers, and the most prominent among them are advisers to kings and lords. They are of particular importance in the Empire of Aedyr, where by tradition, business contracts always require their endorsement. Her devotees are typically found in the upper classes, but any conservative person who longs for a vanished past will find a place in her faith. “When Woedica takes back her throne” is a common saying amongst her followers, signifying a utopian future when society will be properly ordered once again, and she will take her rightful place as ruler of the gods. Galawain is patron of the hunt in all its forms, and he is honored by those whose occupations are concerned with pursuit and discovery. His faithful include frontiersmen, constables, treasure-seekers, explorers, and even scholars, many of whom wear his carved symbol – a dog’s head – around their wrist or neck. He is also protector of wild places and untamed wilderness, where the hunt manifests in its purest form as a daily struggle for survival. That's it for this update. Make sure you head over to our forums to let us know what you think of anything you see here. ..., René Schmidt, and 171 more people like this update. A complete cluster trying to register an account. It allowed me to create, but wouldn't let me log in. Let me reset the password, but still not log in. Would not let me create a new account, as the email address is connected to the account I just created but can't access. THEN... I send an email to the support email address, and it bounces back to me accusing me of being a spambot. What a mess. Very frustrating. OK I have successfully logged in and confirmed my pledge rewards on the backer portal site. I gotta say, the way these KS updates completely gloss over the need to create an account on the site is confusing (eg screenshots going straight from click the 'manage rewards' button to the page for choosing rewards). The reality is, most people who are finding out about the rewards manager system from here on KS are not going to have an account yet, so a bit more attention to the whole 'create an account using your KS email or link the KS email after' thing would help. ps Game is looking awesome, can't wait! Also, could you talk more about any cultures that might have inspired things in this game, and recommend some books where I could learn more about these cultures? I want to learn more! I love the idea behind Woedica. At first glance, I would have never thought her to be law and justice, but suddenly it makes sense, and just with that, I feel I know a lot more about this new world. Great work! Character sheet looks flippin awesome. I really, really, really love the interface. The environment is very nice too, pleaseee, keep doing stuff like this. Im really intrigued about the rest of the U.I. , i mean, character portraits and abilities icons in the main screen. Can't wait to play Eternity looks fantastic! I am loving the visual style. Keep up the good work! Is this the same login info used on the Obsidian forums? nothing is working for me currently, I made an account (must of missed the request to do so in earlier updates) and got a confirmation email, but when I go to re-log in it doesn't recognize my info. Backer portal worked fine for me. Looks like the problems from earlier are resolved. love the way everything looks. pretty much the quality level i've come to expect from you guys. i did get the backer site to work from me just a few minutes ago, were no problems, hangups or hiccups. but it had been giving me fits since it's release. just figured i'd wait a little while on it, but it's working now thankfully. I got the Retail Collectors Edition and the expansion pack, you guys really know how to make games. I just finished using the Backer Portal and finalizing my order, using Chrome browser. However, it would take about 30 seconds for the next page to load as I went through it. I'm pretty sure we gave it the hug of death. Was able to get in just now. The backer portal is probably under traffic at the moment, not surprised. Their web servers are powered by hamsters. I'm getting server timeouts on both links given in the update. 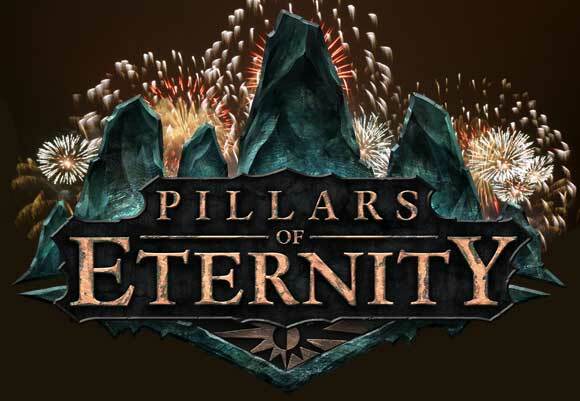 Down for everyone or is it just me says eternity.obsidian.net looks down to them. Ok, glad it's not just me. It looks like the Backer Portal website is down? What news of the new stretch goals for additional areas and companions? Is that happening? The requested URL /backer/ was not found on this server.? Yeah, same here. It looks down. I think i am the one person that would like to see a game made out of concept art. These drawings rock. Portal is giving me an "HTTP 403 Forbidden" error. like everyone else, can't access the backer portal. Can't get in. It's down. No backer portal for me as well. Not that you don't know already. Did the backer portal crash? One link is giving me a 404, the other's giving me a 403. Problems with the Backer portal? A 404 on the portal page and a Forbidden notice on https://eternity.obsidian.net. I am also unable to access the portal; needless to say at this point, I suppose.